The first time Britt saw the girl in the tight, thin dress he knew damn well he was going to have her, or go to hell trying. But he hadn’t reckoned then on the girl’s husband, a sadistic runt of a guy who’d smash in a man’s skull as happily as blink at him. He hadn’t reckoned on Newt, the lecherous, broken man who couldn’t bear to see other men whole. Worst of all he hadn’t reckoned on Ruby, the two-bit floozy who knew every conniving trick of her trade. Copyright 1951 by Jack Sheridan. 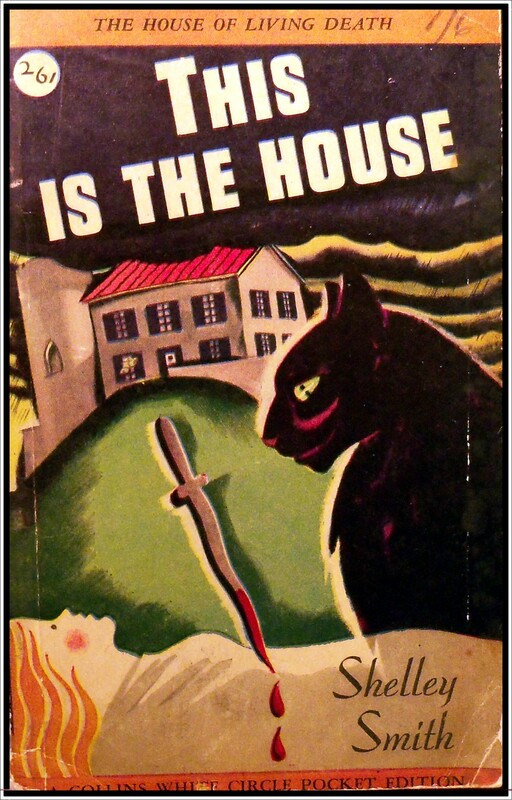 Third Printing, November 1959. In celebration of the glorious British summer we’ve been having this year, here’s my Gold Medal contribution. 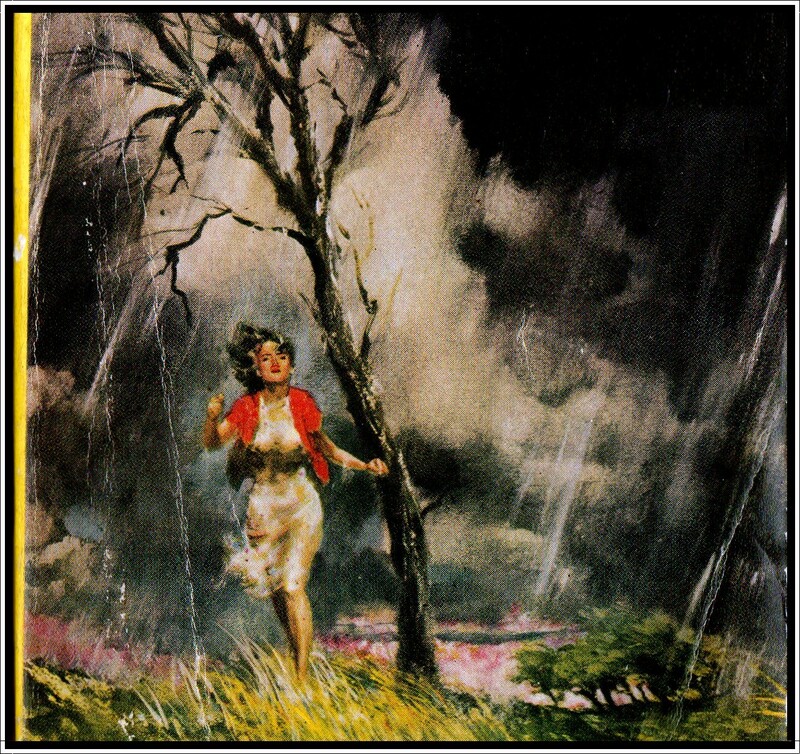 I love this cover – as dramatic and storm-tossed as any I’ve seen. 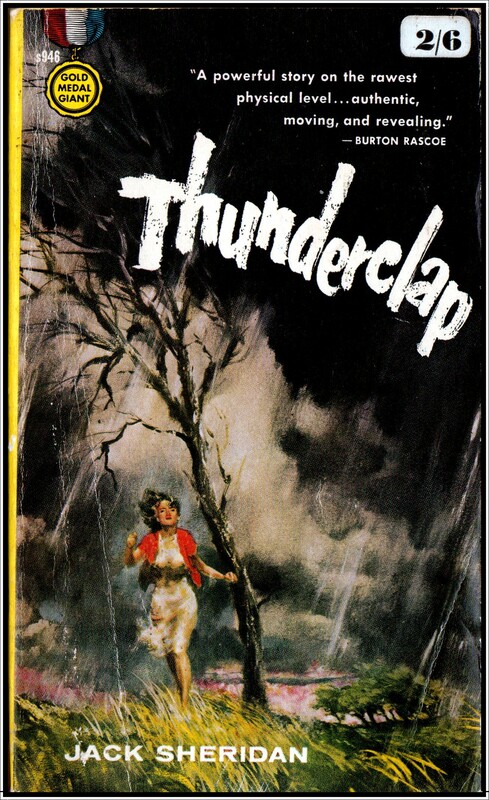 Posted in books and tagged Cover art, fawcett crest, fawcett crest gold medal books, Jack Sheridan, pulp fiction, Thunderclap, vintage books, vintage paperbacks. Bookmark the permalink. These Flawless stories are the work of a master who has chilled the spines of readers for over a century. First published 1960 by Pan Books Ltd. Tenth printing 1965. 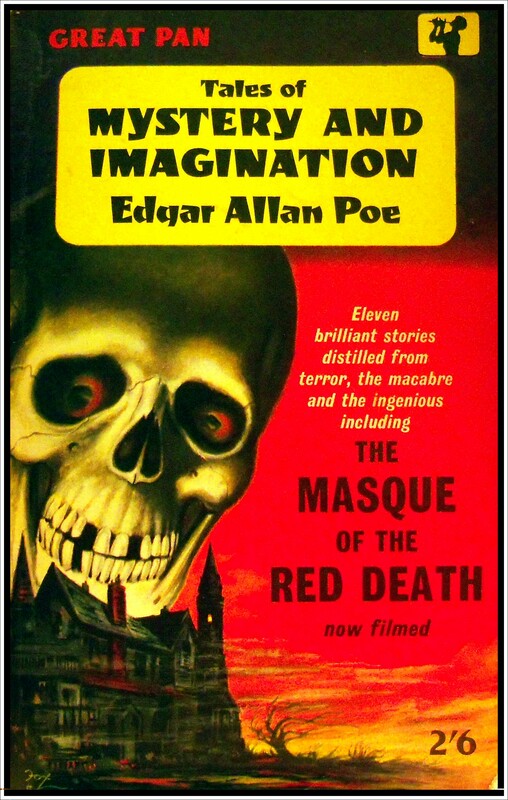 Posted in books and more books and tagged classic horror, Cover art, Edgar Allan Poe, Fall of the House of Usher, horror, Literature, Murders in the Rue Morgue, Pit and the Pendulum, pulp fiction, Purloined Letter, vintage books, vintage paperbacks, World Literature. Bookmark the permalink. Jerome Podwil is one of my favourite cover artists. I have more scans of his ‘gothic’ cover art over on my other blog. 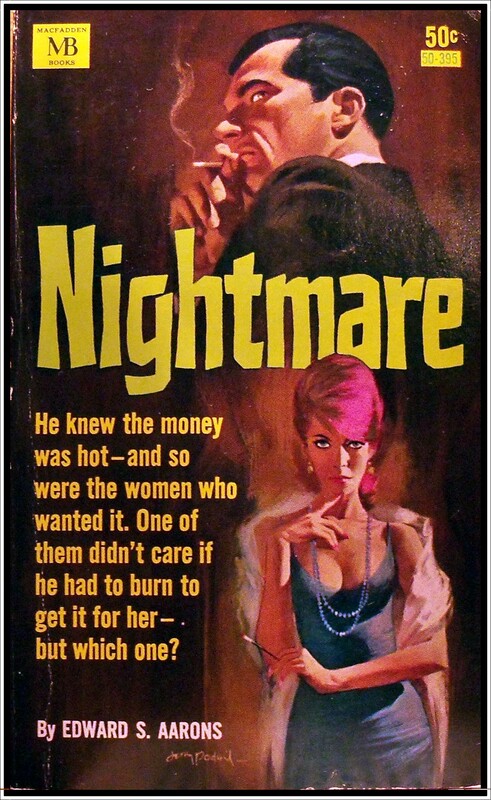 This cover for Nightmare – (written by Edward S. Aarons, a prolific thriller writer whose career spanned from the 40’s – 70’s) – is gorgeous, and I just love her hair! Nightmare by Edward S. Aarons. Macfadden second printing October 1967. Cover art Jerome Podwil. Pain roared through his shoulder. He couldn’t see beyond the intolerable, torturing glare. The dwarf’s voice came from somewhere beyond the haze. My, my, my, this book seems to have a bit of something for everyone – a private eye being probed by a twisted dwarf and his sadistic nurse girlfriend… what’s not to love? Posted in books and more books and tagged Cover art, crime, Edward S. Aarons, jerome podwil, jerome podwil cover art, nightmare by edward s aarons, pulp fiction, thriller, torture, vintage paperbacks. Bookmark the permalink. Another undersea adventure with some more great cover art by Paul Lehr. 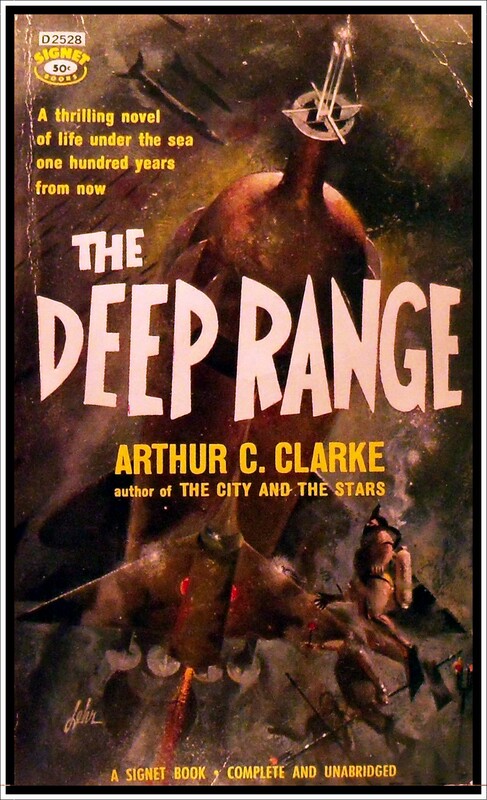 The Deep Range by Arthur C. Clarke. Signet second printing July 1974. He was a misfit – a space-ship engineer who had developed such fear of outer space that he could no longer function. Permanently separated from his wife and children on Mars, he faced a terrible future back on Earth – unless through psychiatry he could create a new life as a warden of the oceans’ depths. Taut with excitement and suspense, this is a thrilling novel of tomorrow and a fascinating picture of the weird and sometimes terrifying life beneath the seas in a future when submarine patrols harvest the water’s wealth to feed the world. Posted in books and more books and tagged Arthur C. Clarke, Outer space, paul lehr, pulp fiction, science fiction, signet books, the deep range, the deep range arthur c clarke, vintage paperbacks. Bookmark the permalink. Welcome to House of Secrets, an online depository for some of the bad, the beautiful and the downright bizarre books I’ve been lucky enough to stumble upon over the years (& years! )I’ve spent rummaging around in the darker corners of arcane bookshops and specialist book fairs. 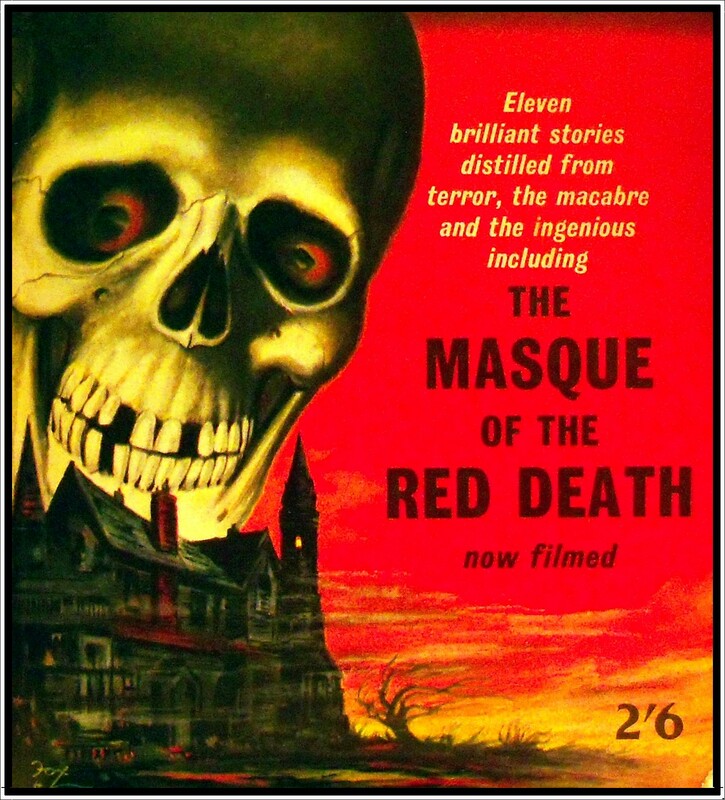 Based in Brighton, East Sussex, I buy, sell and collect vintage pulp fiction from the 50’s, 60’s and 70’s – in particular horror and gothic romance. I also create unique gifts with a gothic twist and will be posting some photographs soon. Check out the Events page for details of Markets etc where I will be trading. Any questions, feedback or if you just want to say hi, please email me via the contacts page. Posted in books and more books and tagged books, crime, gothic romance, horror, mystery, pulp fiction, science fiction, vintage paperbacks. Bookmark the permalink.